"Huh... We're not sure what to... Huh... Um, sir? Mr... Giggles, is it? Listen, it's not that we're not happy to have you here at this kids birthday party. We're thrilled! It's great to have some outside entertainment for the kids. They get so cooped up in the house, watching whatever they find on Netflix, or absorbed into some video game. So, of course, we want them to see some real-life entertainment. It's just that... Well, honestly we expected something a little bit more, how do we say this? Kid friendly? And it seems, based on your appearance, that you lean more toward the kid terrifying side of the spectrum. Is that accurate?" "So maybe... Well, this is so awkward since we've already paid, but maybe you could do some balloon animals! Do you do balloon animals? No, a human skull isn't an animal. Any magic tricks you could do? No, pulling a human skull out of your hat is not a magic trick. Okay, maybe we're going the wrong direction. How about some slapstick? Any good pratfalls? No, slipping on a human skull is most certainly not a pratfall. Listen, why don't you keep the money and just spend some time on yourself, huh? Go out, get a massage, maybe a well-deserved and well-needed manicure? Yes, we're absolutely sure. No, please don't come back later tonight. We're happy with your performance. Definitely getting a five-star review on Yelp. Just... just forget our address, would you?" If your goal is to create a lifelong fear of clowns in anyone who sees you, this is the costume you've been waiting for. 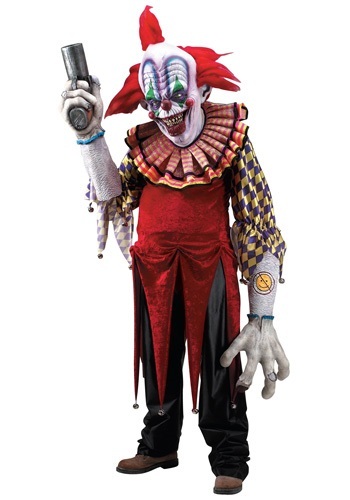 It features a long tattered looking shirt with bells attached, long monster arms with a handle for creepy movement, and an oversized clown mask. Go ahead and keep clowning around, just don't try attending any kids birthday parties.